An automatic ice maker can increase a refrigerator's energy use by 14 percent to 20 percent. Is having ice on demand worth that much of a jump to your electric bill to you? If not, you’ll be happy to know that you can turn your ice maker off. It’s very easy and takes less than a minute to do. You may also want to turn off your ice maker if you are going to be away from home for a week or more. There is no need to keep making ice if you aren't going to be using it while it is fresh before it absorbs odors and off-flavors. Models with switches: Look for a switch on the front of your ice maker. If you see one, simply flip it to the "off" position, and you're done. For GE electronic ice makers, there may be an on/off toggle switch. The I is for on, and a green light will be lit. To turn it off, set the power switch to O for off. If there is an on/off slide switch, you turn it off by sliding the switch, so the paddle is under the icemaker. Models without a switch or metal feeler arm: If you don’t see a switch or an arm on your ice maker, it’s probably one of the new models that require you to hit several buttons in a specific sequence to turn the unit off. Refer to your owner’s manual or the manufacturer’s website for instructions on how to do it. 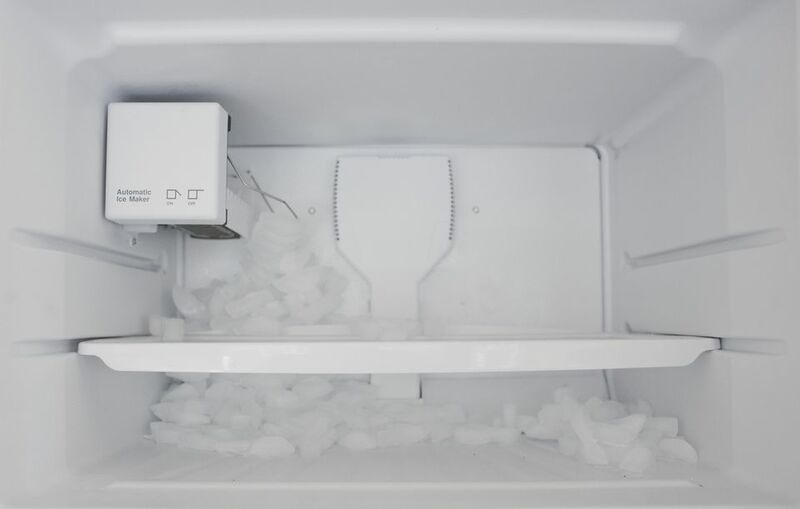 Turn your ice maker off right after you hear it drop ice into the bucket, so the ice cube tray won’t have a chance to fill back up with water. You don’t want to leave ice sitting in the ice maker. Use or discard any ice that has been made. It will begin to absorb odors and won't be appetizing to use after a few days. Do you want to remove your ice maker permanently? Consult your refrigerator manual for instructions. You can always set the ice maker aside in case you change your mind later or want to reinstall it before you sell your fridge. Taking it out won’t harm it in any way. Use the space occupied by the ice bucket to store a couple of ice cube trays. If you don’t change the water filter in your refrigerator regularly, the water that you’re using to make your ice could contain bacteria and mold. It looks like those old-school ice cube trays win again. You can wash them after each use, by hand or in your dishwasher.